Before the new A427 was built, it used to meander through Cottingham, Middleton, Stoke Albany and Wilbarston following the route of an old 'turnpike' road (route marked in yellow on the map opposite). Turnpike Roads (named after a toll bar placed across the road) were created from around 1750 on major routes. Upkeep and repair were paid for from tolls, collected from traffic using the road from specially-built toll houses. The 1841 Census records a dwelling called 'toll gate' in Cottingham. In 1840, turnpike road repair costs for Cottingham were recorded at £14/2/-. Middleton Lane, the road running across the top of the Dale, lies along the route of a medieval track, and Corby Road follows the route of a Roman Road running from Huntingdon to Leicester. Running south off Middleton Lane (towards Cattage field) was a track called Wood Lane, which is recorded in the 1841 Census. This still remains as a bridleway, joining Middleton Lane and the A427. Both Middleton Lane and Wood Lane are shown on the 17th Century map above. In 1841, the street names in Cottingham were very different to the ones we see today, with only Blind Lane and High Street remaining (see Street index). I have taken a stab at which old street names correspond to the modern ones, but would appreciate any help you can give me on this one! It may seem logical that the 1841 Church Lane became today's Church Street, but I'm not convinced. The 1841 Census shows John Chamberlain (Grocer) living on King Street, and we know that he had a shop in Church Street in 1861, so it would seem more likely that King Street became Church Street - and maybe Church Lane became Water Lane? Again, if anyone can confirm this one way or the other, I'd love to hear from you. The road names in 1881 and 1901 were pretty much the same as today, except that Dag Lane and Pinfold Bank no longer exist in the village. 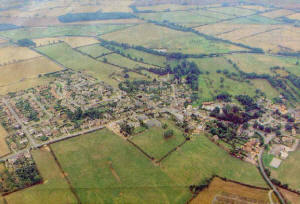 The crossroads at the centre of the village is still referred to locally as The Cross. Dag Lane took it's name from the droppings that hang from a sheep's underside (yeuch!!). This road has since been renamed School Lane - little wonder really! Pinfold Bank was on the right hand side at the bottom of Blind Lane. In early medieval times, most dwellings in Cottingham would have been fairly temporary wattle and daub structures, needing rebuilding every generation. Most were single-storey, consisting of one or two rooms, with floors of beaten earth, covered with straw. Peasants often shared their homes with their animals, and life expectancy was 40 to 45 years. 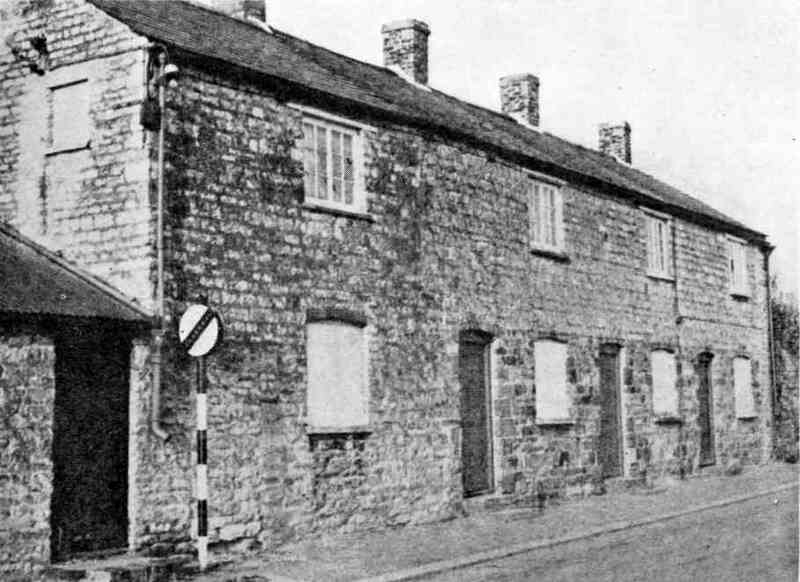 Some of the ironstone cottages in the village date back as far as the 14th Century. In the 19th Century, many 'one up, one down' cottages were built in Cottingham and the surrounding area for labourers and their families. As the name suggests, these houses had just one downstairs room, and one upstairs room. The picture opposite shows a row of one up, one down cottages that used to stand on Corby Road, next to the entrance to Blind Lane. The cottage on the left is actually two up, two down. Mike Williams tells us: "My grandmother Mary Monk kept house for the occupant who was Harry Goode. She stayed with Harry from 1939 to 1962 although they did move to the new Council House development in Middleton in 1950s. The blocked off door by the cottages (behind the traffic sign) was where the bucket toilet was sited along with all of Harry’s gardening tools. There wasn’t a lock on the door so every one sang very loudly." In 1901, more than half of the families in the village were living in four rooms or less, with two couples' accommodation consisting of just two rooms. And spare a thought for 44 year-old widow Sarah West bringing up eight children in just three rooms! 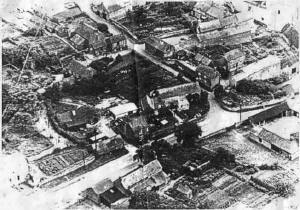 At that time there was no mains water, and water for washing, cooking and toilets was collected from the pumps and wells around the village. Few (if any) cottages had inside toilets. Some loos were much as we know them today, except that you had to tip a bucket of water down to flush them. However, some people just used a wooden plank with a hole over a cesspit. Worse still, some used buckets, and the waste was collected by a lorry that went around the village. Mmmm - nice job! David Dodd, who lived on Frog Island, Rockingham Road in the 1930s and 40s recalls: "A brick built 'privy' was located also about 20 yards down the garden, right next to the pump for the drinking water! The construction was no more than a deep pit in the ground with a wooden box over having two circular holes in it, one large and one small. Each privy was shared by two families. When the time came to empty the pit the men of several families would join forces to ladle the 'sludge' into wheelbarrows and deliver it to a pre-dug trench in someone's garden. Turns were taken to receive the 'sludge' as it made good manure. I can still remember trotting down the garden path at night, matches and candle-stick in hand, with advice to 'be sure to use the small hole'." 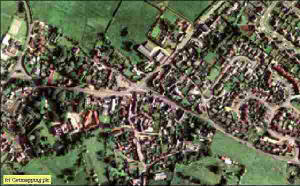 Photograph derived from 2m resolution aerial photography supplied by Getmapping plc.